To describe an English book by an Afghan man about a journey across Asia and Europe by using an Italian art term may seem unexpected, at the very least. However, there is a reason for the term. Some of Italy’s greatest painters, such as Caravaggio, used chiaroscuro (light-dark) to juxtapose light and darkness in such a way on the canvas that an image left the two-dimensional surface with an enduring three-dimensional impact on the viewer. Passarlay has done just this with his readers. In the course of his long journey, kindness and cruelty, brutal neglect and unexpected kindness sit next to each other on the page. The reader is left reeling from the impact. If this were fiction, Passarlay and Ghouri would surely be in the running for a prize. Sadly, it is not. This is the account of a global crisis from the perspective of a twelve-year old boy, and it could not be more powerful. It was Stalin who once said that ‘one death is a tragedy; one million is a statistic’ . Whilst I hesitate to agree with him about anything – it is true that the scale of the refugee crisis has numbed us to its human cost. As the numbers mount, our ability to feel their impact is diminished. Passarlay’s is a small voice reversing that trend. This is a book which enables the reader to inhabit the experience of those fleeing across Europe and thereby to gain some understanding of it. There is a world of difference between the book’s intense narrative and the tabloid headline which simplifies the crisis to a few one-sided words. Read it, and find the flame of your humanity kindled all over again. As the author says, it is ‘more than anything a book about faith, hope and optimism’. Something strange happened to me as I read this book. I found myself so engaged with the narrative that I was unwilling to stop. Every time I put the book down, I felt guilty – as if abandoning Gulwali at the roadside. I told him as much, and he played the game with me – commenting on the places where I had ‘left’ him and urging me to come back soon. How many other voiceless ones would say the same thing, I wonder? Gulwali Passerlay has a dream. 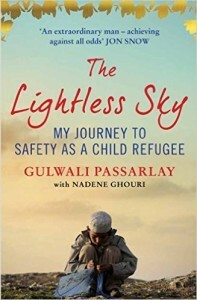 The dream is that one day a child will read his book and ask ‘what was a refugee’? That day is a long way off, but this wonderful book might just bring it closer.